This reading and listening exercise is about the Spanish tradition of Las Tunas. This is suitable for level A2 Spanish students, though it contains some B1 and B2 grammar points. Scroll to skip directly to the exercise. But first, what is this Tuna, and does it have anything to do with fish? Have you ever travelled to Spain and seen a group of musicians, usually young men, playing and singing in the streets of the old town, wearing what looks like the fashion of the Renaissance or Medieval times? If you have then you have seen the peculiarly Spanish tradition of La Tuna Universitaria (not to be confused with the fish! The word for tuna is Spanish in atún). Members of the tuna are called tunos (un tuno, dos tunos). They are university students and big universities have one per faculty. There's a the video below the "bilingual reader" so you can see what they look like (but it's not part of the exercise - it's just for information). The video shows the tuna of the University of Seville’s Faculty of Medicine, you can recognise the tunas from different faculties by their distinctive beca (the v-folded felt they wear on their chests and over their shoulders) embroidered with the coat of arms of their faculty. They have patches of all the cities they have visited sewn onto their capes, and the ribbons also sewn on their capes are favours from the girls they meet and serenade. 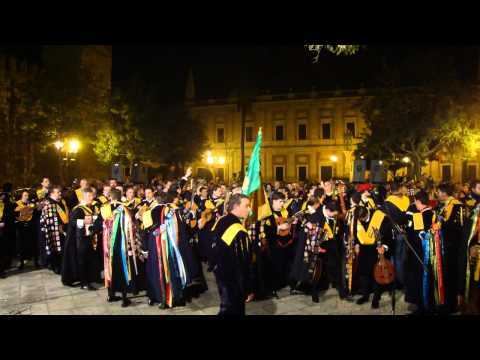 If you watch the section near the end of the video you can see the abanderado (the flag bearer) dance with his flag and also the tambourine players performing their traditional dance with their panderetas(tambourines). In Seville the tunos have a special role to play on the evening before the feast day of the Immaculate Conception, which is a public holiday in Spain and is celebrated on 8 December every year. In the evening of 7 December, they congregate in the Plaza del Triunfo in front of the monument dedicated to the Inmaculada Concepción of Mary. There they serenade the statue of Mary with traditional songs. The bilingual reader article below was written and recorded by Kwiziq's Spanish expert, the fabulous Inma Sánchez. Click play to listen to the article. You can read the transcript at the same time or after. Click any phrase for the translation and links to related grammar lessons which you can add to your Kwiziq notebook to practise later. Here's a video so that you can see what they look like, it's not part of this exercise!